Let me be clear; Amsterdam does not equal Portland. Tim said it, I say it, they’re different geographies. They’re different cultures. As Michael mentioned in last week’s comments, a lot of people in Oregon worked hard, and continue to work diligently, to change the legislation that will support more bike infrastructure. 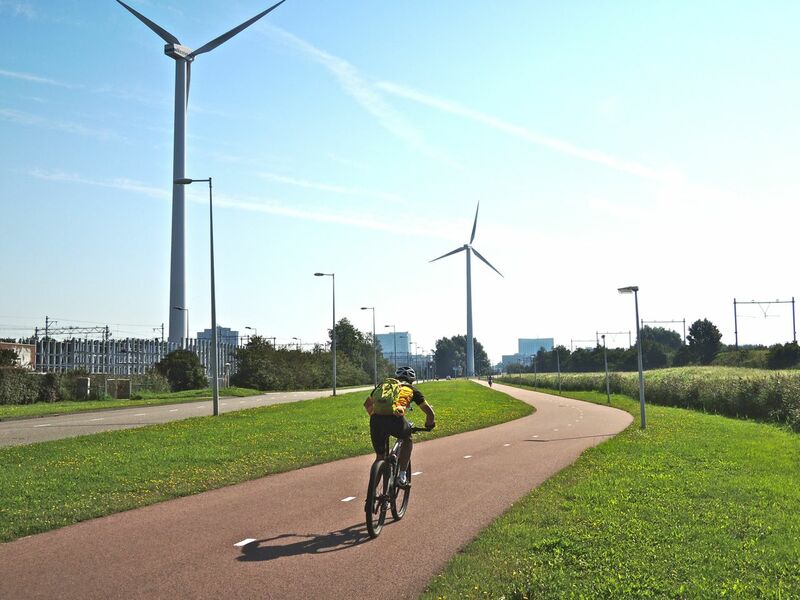 I talked to a Dutch lady who frankly stated, “Americans do what’s best for the individual. We do what’s best for the most people.” That shows in the way they’ve chosen to give over most of the street to mass transit and bike transit because those facilities provide for the greatest number of users per unit area. 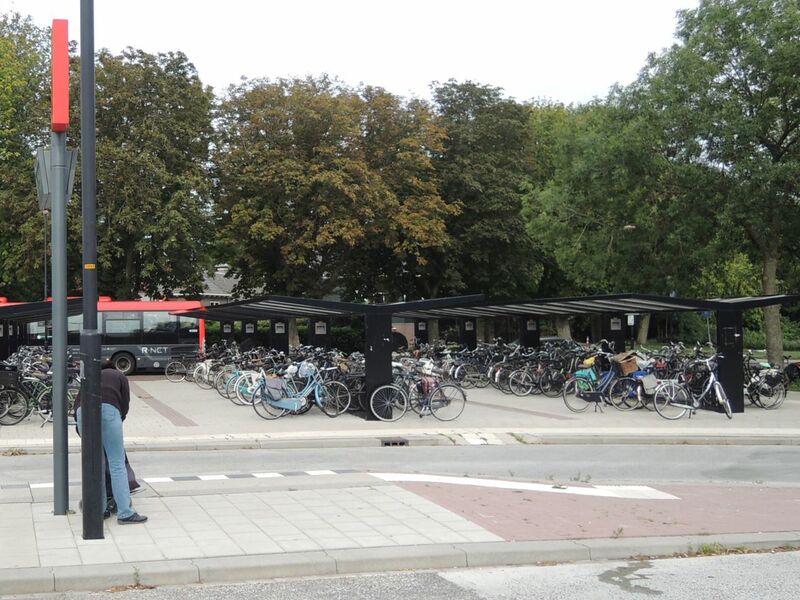 This is one half of the bike parking area at a bus station about six miles from downtown. Note that it is mostly full. 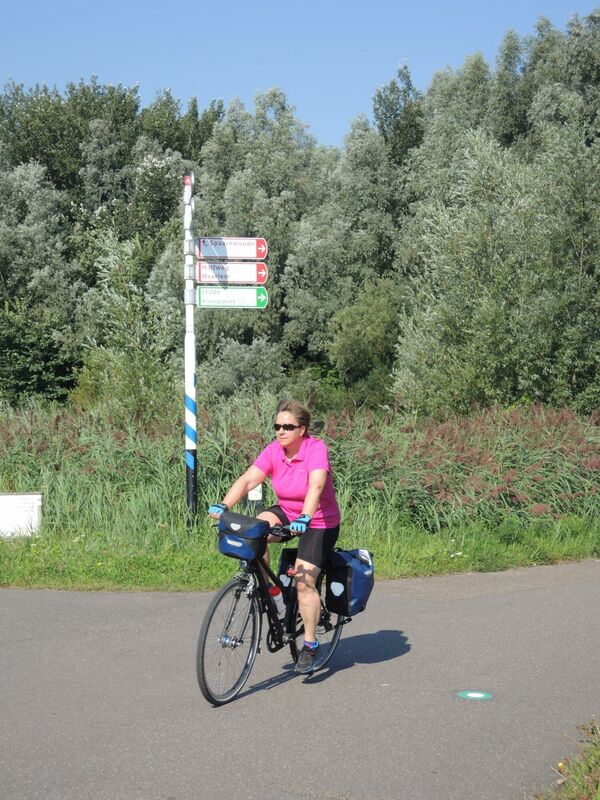 The facilities the Dutch chose, make it easy to get around without a car. We’ve chosen the opposite. But what if we thought of people first? 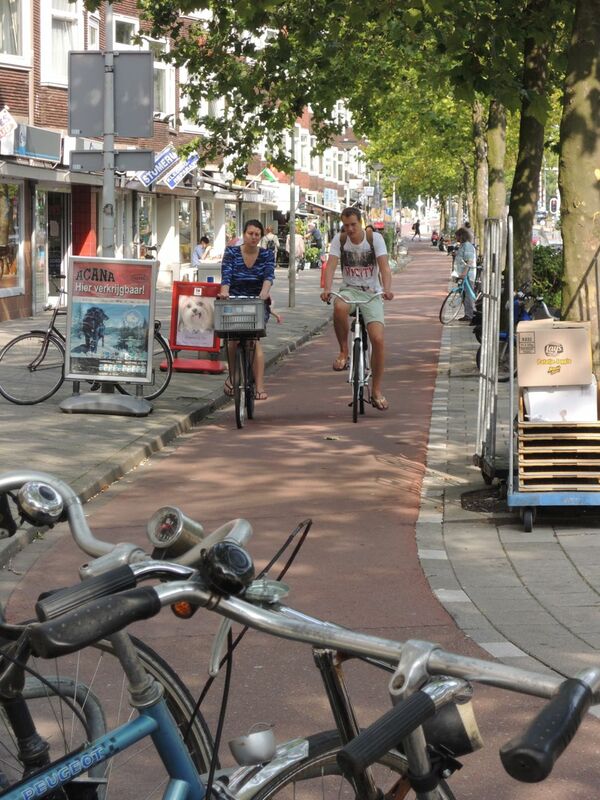 Doesn’t this look like a nice way to ride down a busy shopping street? 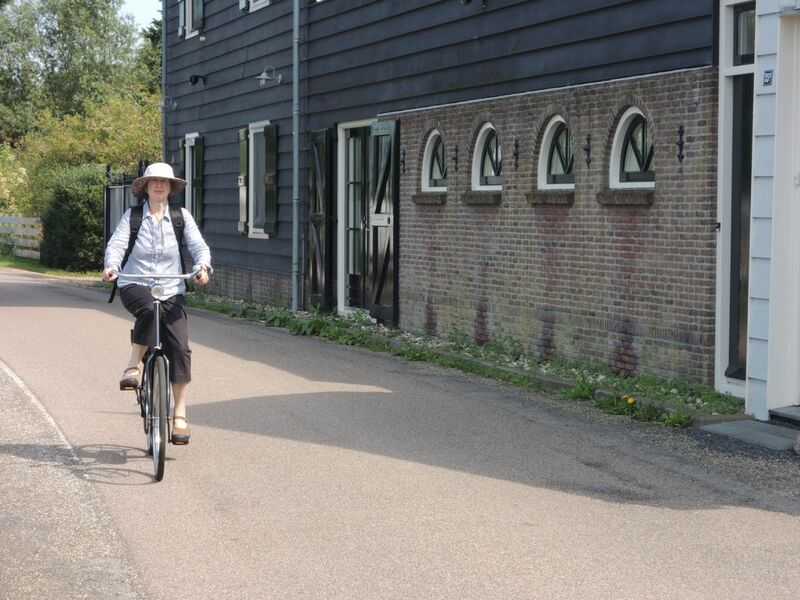 Amsterdam is pancake flat, but some of Portland’s suburbs are pretty flat too. What if we created a Slow Transit movement. It would be fun, relaxing, and healthful. What if the burbs were focused around inviting pedestrian greenways? What if we thought of designing places for people first and cars second? One area we’re doing well at, is signage. As you can see here, there are lots of ways to get it right. Here’s a shared local road and bikeway a few miles outside of town. There weren’t a lot of cyclists in Amsterdam. There were a lot of people who rode bikes. The facilities make it easy for them to get there without a lot of gear. 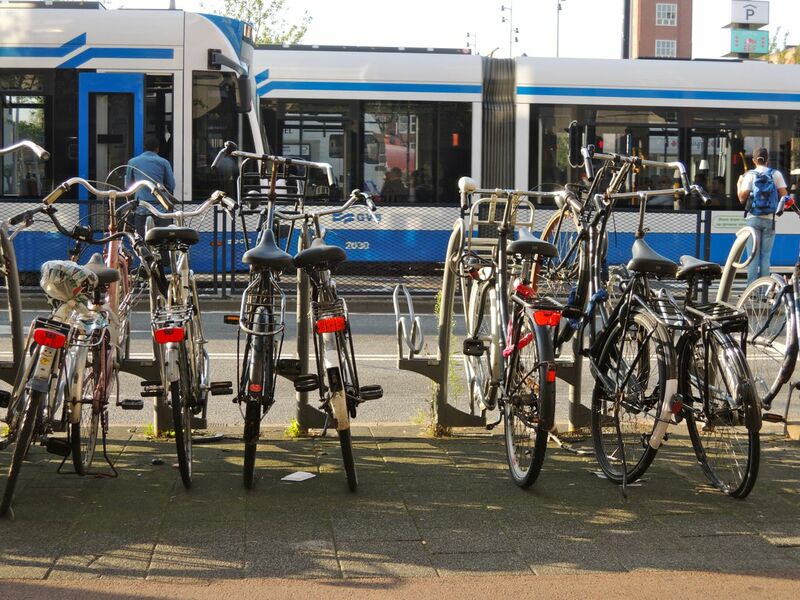 Bikes and their riders in Amsterdam aren’t generally geared up. A majority of the bike shops I visited just sold basic bikes, baskets, and a minimum of accessories. I’m not saying build it and they will ride, but if we don’t, what’s going to change? Exactly. Good luck changing this mindset where we must all fall into orderly categories that makes sense and commercially identify us in ways that separate us from “normal.” It frustrates me to no end. I think the Dutch Lady nailed the head. Part of the problem is the incessant consumeristic aspect to everything that we do. Ex: If you bike, you must wear bike clothes and special shoes, and you must upgrade your bike every year and demand showering facilities. I would argue that bike technology stopped really progressing back in the 70’s, and everything afterwards has been a modicum of progress that has really only been hyper-sensationalized to sell more bikes. My steel, threaded headset-tall handlebar bike is just fine thank you very much, and I don’t even need the special shoes. I lay much of the blame on industry, publicly owned companies, and the quest for never-ending profit. I bought my first “real” bike about 12 years ago, and was immediately told by the salesperson I “NEEDED” shoes and shorts, etc. I just walked out with the bike…and the shoes… hurt my knees, hurt my feet, got frustrated, almost gave up. I wondered why I had so much fun as a child on my bike but now it seemed like work. Then, one day, the frame cracked (aluminum), and someone put a Rivendell Reader in my hand, I acquired a steel bike, and I never ever looked back, and I’ve rode my bike with Joy and a Smile for the past 10 years. I’m not a biker. I’m a dude who rides a bike. If my Dad’s 3 speed Raleigh was good enough for him, it’s good enough for me. So I dropped my 27 gears to 3, and look at me go. 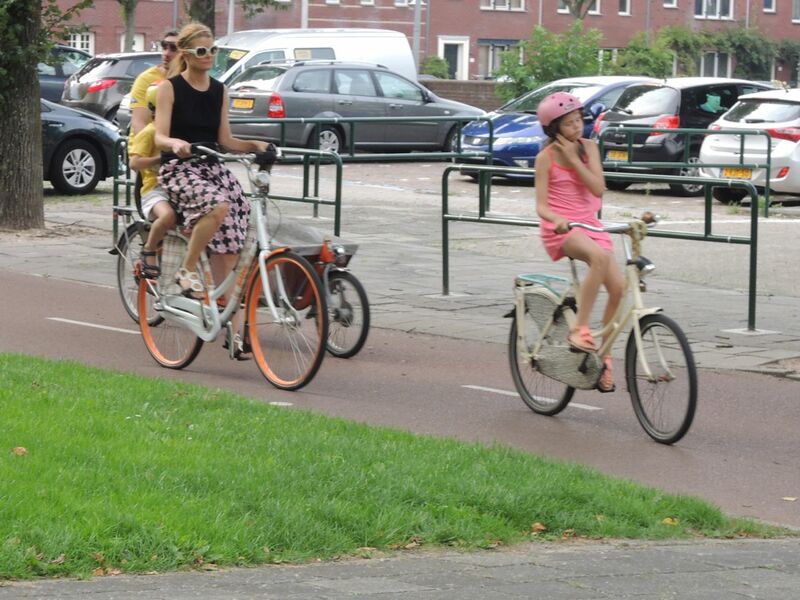 In Utrecht once, I noticed I could BUY a bicycle for 250 euros… a Dutch design that has stood the test of time. I could have gone to the NL on vacation, BOUGHT a bike, rode it around for 10 days, then left it at a train station with a sign on it for “free” and come away clean and minimal loss and I bet that bike would go for another 20 years in the hands of a run-of-the-mill citizen. Cars are the same. I’ve rented cars in Europe with 1.6L engines, and their same body equivalents in the US are at a minimum 2.8L or more. Same car, completely different engine size. A dealer told me there’s “no market” for a 1.8L engine, even though I was pleading for it. 45mpg, (no froo-froo hybrid) just a small engine in the same body (maybe lighter since in Europe you’re not going to be clobbered by a F350 driven by a texting teenager). Again, this is an example of a market choice that is being forced upon us. This is not a free market, it’s a coerced one with limited choice. That’s a pretty epic comment. Worthy of a post in and of itself. Viva la revolution! Paradigm change is a slippery slope. When people demand others think and behave as they do, there is no telling how things will turn out. But when something becomes popular, the change can be phenomenal. Portland’s hip-culture bike friendly environment is a perfect example. Young people create change. The trick is for older people to buy into the new way of thinking too. Then you have a revolution.